I liked Ron Rash's first novels before I had a chance to meet him, first at our state English Teachers' conference and later at our college Writers Symposium. His self-effacing nature when he meets his audience only adds to my motivation to read his work. Some writers may enjoy book tours and the limelight. I suspect that many, like Rash, would prefer to be somewhere quiet writing. He is disciplined enough, according to reports, to write three hours every day. Still, he manages to be gracious to his readers and fans, taking the time to talk about his work. As a reader and a fan, I am more glad that he carves out that time to write. Rash's latest novel The Cove is set in familiar territory--Western North Carolina, specifically in the town of Mars Hill, where the small church-sponsored liberal arts college of the same name is located (undoubtedly named for the Areopagus--Mars Hill--where the apostle Paul delivered his famous sermon about the unknown God). 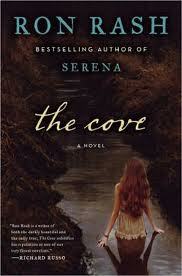 The protagonist Laurel Shelton lives with her brother Hank in the Cove, an dark area avoided by the locals, considered haunted. Because of her large purple birthmark, they also ostrasize Laurel, some even considering her a witch. Only Slidell, their older long-time neighbor is willing to interact with the siblings without hesitation. The novel takes place during World War I in a part of the country where citizens don't always march off to war with blind patriotism. Not far from here, the conflicts at "Blood Madison" occurred between fellow townspeople fighting on opposing sides during the Civil War. As the story opens, some of the young men are returning from fighting, physically and emotionally scarred, including Hank, who has lost a hand. The darkly comic antagonist of the novel is Chauncey Feith, the son of the local banker who has enlisted but remains safe in the recruiting office, playing war games with his own troop of young local boys. He drills them, preparing them to enlist once they come of age, but relegates most of his battles to the safety of challenging German books in the college library and garnering opposition to the older, once-respected German professor there. Something in his final showdown reminded me of George Orwell's "Shooting an Elephant," in which the first person narrator (presumably Orwell) takes action against his better judgment, noting that his "whole life, every white man's life in the East, was one long struggle not to be laughed at." The catalyst for action in the plot occurs when Walter, an escapee from an internment camp ends up in the cove, apparently mute. He possesses a talent, however, playing the flute. In fact, when Laurel first hears him, she thinks she may be hearing one of the rare fabled Carolina parakeets. He provides a convenient suitor for Laurel, a hard worker winning the approval of her brother who plans to marry soon, but delays revealing to Laurel he must leave their cove or lose approval of the girl's father. In Laurel Shelton, Rash has created a vulnerable, broken young woman, defensive to a fault, eager for love, curious about the sparse clues from the stranger, stuck in an exile not of her own choosing. She joins the roster of strong women--no two like--that people Ron Rash's novels and short stories. Like his other works, I know too that I can recommend The Cove to some of my pickiest readers, the one who stay up until the wee hours of the morning to finish his books, then email me a note of thanks before going on to sleep. I usual explain to people that I prefer to read fiction over nonfiction, but when I look at my reading list, I have to qualify that assessment. What I find, though, is that I love a good story well told above all. 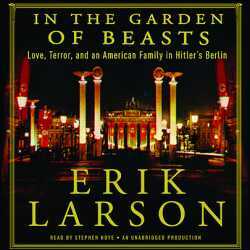 I first discovered Erik Larson's work when I read The Devil in the White City, his book that tells of the people who dreamed of the Chicago World's Fair and brought it to life. In that book, while looking at the big picture, Larson wove a narrative thread of a doctor in town who became a serial killer, luring young women who had arrived in town, single and independent for the first time, then murdered them. While that story was particularly disturbing, the facts and details he used to balance it, telling about the architect heading up the plans for the exposition, Buffalo Bill's performances outside the perimeter of the fair, the first Ferris Wheel, the fire--all were fascinating to me. In fact, the year I read the book, I went to Chicago with my husband on business and while he worked, I visited the Museum of Science and Industry, the only permanent building of the World's Fair, and Graceland Cemetery, known as "the architects' cemetery" to see the graves of so many people mentioned in the book. I went on to read Thunderstruck, the story of Marconi and the invention of the telegraph, told alongside the story of Hawley Crippen--another true life murder mystery. 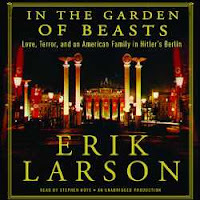 This summer, after visiting The United States Holocaust Museum in Washington, D.C., again, I began reading Larson's latest publication In the Garden of the Beasts. There have certainly been many various accounts of Hitler's Germany, but this book focuses on the early years, beginning in 1933 when William Dodd was named U.S. Ambassador to Germany. An unlikely pick, Dodd and his family spent several unsettling years in Berlin during Hitler's rise, as America and most of Europe seemed to ignore all warning signs, intent on keeping peace--or attempting to recoup the debt of Germany owed to American investors. In this book, Larson focuses on Dodd and on his adult daughter Martha, who traveled with her father, mother, and brother, leaving behind an estranged husband about whom she told almost no one. She lived an exciting, sometime scandalous social life, consorting with men of all nationalities--including prominent Nazis--and falling in love with a Russian diplomat charged with recruiting her to spy for the Soviet Union. In the novel, Dodd is shown and often misunderstood and maligned. He was an academic placed amid the "Pretty Good Club"--diplomats living on inherited wealth, far above their salaries. Dodd insisted on shipping his old, plain Buick to Berlin and living as a model for American citizens suffering through the Depression. His example earned more ridicule than admiration. Dodd seemed to open his eyes more quickly to Hitler as a threat, but his warnings were barely heeded. Only years after he was recalled to the States--leaving reluctantly--did other recognize his insight. Through the stories of Martha's interactions with the people of Berlin, Larson also introduced a number of American journalists--some with Jewish heritage--working in an increasingly threatening environment. While it seems that everything that could be written about this part of the world at this particular time has been written, Larson's book manages to serve not only as a historical account, but as a warning to readers to pay attention to the world scene, not discounting aspiring leaders with ridiculous agendas. Hitler, while seeming cartoonish and laughable, certainly inspired much more than mockery. Most of the time when I read short stories, I am selecting them from an anthology featuring different writers. Occasionally, I have the luxury of reading several by a particular author. In fact, in the fiction unit of the literature course I teach, I sometimes have my students read several stories by one author in order to discover common elements of style. Our text usually includes several by one of my favorites, Flannery O'Connor, as well as Hawthorne or Faulkner. When author Ron Rash appeared at our Writers Symposium a couple of years ago, in addition to teaching his novel Serena, I also used some of the short stories from his collection Burning Bright, which particularly struck a chord with our students. The short stories in Tamra Wilson's first collection Dining with Robert Redford, many of which have been published in a variety of journals come from the perspective of a variety of women, mostly working class Southern women. 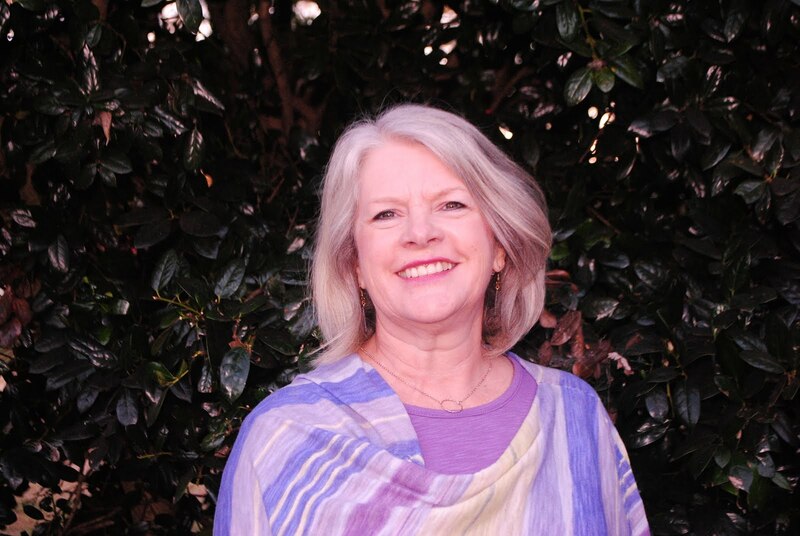 Wilson is a native of Illinois, but having lived in the South for years now, she brings the stories to live with colorful details, recognizable settings, and authentic voices. Hers are not necessarily happy women; they often seem to have an edge of dissatisfaction and disappointment, borne out in their attitudes toward the people with whom they live and work. While Wilson's protagonists often come across as judgmental--displaying thinly veiled jealousy, sanctimoniously dining on gossip, comparing themselves--almost invariably favorably--with the neighbors, they resemble in spirit Flannery O'Connor's Mrs. Turpin of "Revelation" or Mrs. Hopewell in "Good Country People." Readers may feel critical of them only up to the point of recognizing ourselves and our own flaws. One thread that runs through the collection is the fine line between settling and accepting one's circumstances and limitations. Readers are forced to question the current educational environment, forcing young people toward paths before they've had time to develop their own interests or to live up to their parents' dreams of uber achievement. Wilson's characters also deal with consequences of early choices and actions, forcing them into dead end jobs or doomed marriages. While the underlying themes are serious, Wilson constructs her stories and her characters with humor and sympathy. The conflicts aren't life and death; they are simply real life. Readers will find themselves comfortable pulling up a chair in the kitchen or pulling up a chair at the quilting bee right alongside these folks--or peeking out their windows to see what the neighbors are up to now. Tamra Wilson demonstrates that the richness of story doesn't come as a Southern birthright but as a result of simply paying close attention in a small-town life.